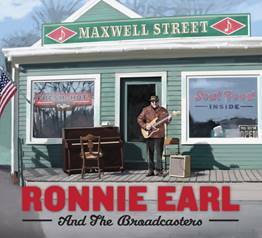 Stony Plain Records has announced a September 9 release date for Maxwell Street, the new CD from three-time Blues Music Award winner as “Guitarist of the Year,” Ronnie Earl and his band, the Broadcasters. Maxwell Street is named in honor of the late blues pianist and previous member of the Broadcasters, David Maxwell, and is also a nod to Chicago’s famed Maxwell Street, where blues musicians gathered to play outside for the Sunday market crowds. Ronnie Earl and the Broadcasters are: Ronnie Earl – guitar; Lorne Entress – drums; Dave Limina – piano and Hammond B3 organ; Jim Mouradian – bass; and Diane Blue – vocals. Special guest guitarist on the album is Nicholas Tabarias. Maxwell Street was produced by Ronnie Earl and recorded at Wellspring Studios in Acton, Massachusetts, and Wooly Mammoth Studios in Waltham, Mass. Ronnie formed his band, the Broadcasters, in 1988. Maxwell Street showcases 10 tracks, including six originals, plus exciting covers of songs by Otis Rush (one of Ronnie’s main musical mentors), Double Trouble; Gladys Knight (I’ve Got to Use My) Imagination; Eddy Arnold, You Don’t Know Me; and the blues/soul chestnut, As the Years Go Passing By, which closes the album. Ronnie Earl and the Broadcasters are also represented with a track on the new Stony Plain special 3-CD set, 40 Years of Stony Plain, which salutes the label’s four decades of the best in roots, rock, folk, country and blues music.